Enjoy Japanese Spring Traditions at Nikkei Centre’s annual event, Celebrate Spring. Delicious Japanese cuisine, traditional martial arts, dances and music, tea ceremony, bonsai display, art, crafts and more! Bring the kids to our outdoor kids zone in the garden with a variety of activities to entertain children of all ages! 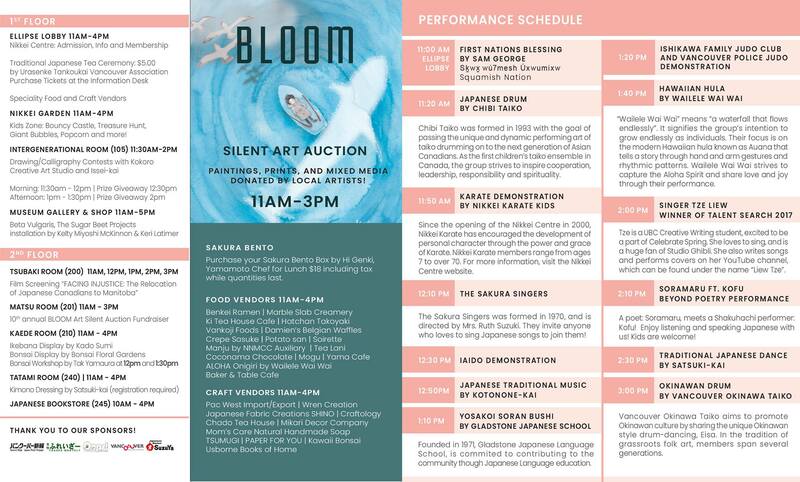 Also this year, Nikkei National Museum is pleased to present the 10th Annual BLOOM Art Silent Auction onsite and a film screening: Facing Injustice. This is your chance to collect original paintings, prints, and pottery that you like! Remember to bring your NNMCC membership card for free entry. Parking is limited, we encourage visitors to transit, bike, and walk. Click here to find participating BLOOM Silent Art Auction Artists. Enjoy the beauty and elegance of a traditional Japanaese Tea Ceremony at Celebrate Spring | 春祭り. Experience the principles of harmony, purity, respect and tranquility with a delicious sweet and traditional bowl of matcha hosted by Urasenke Tankoukai Vancouver Association. Advance reservations accepted online for $4.00 per person. Save your seat with advance tickets to this popular Tea Ceremony at the Celebrate Spring event. Drop-in tickets will be available at the Nikkei Centre Information Desk on April 21st for $5.00 per person. Please note that admission to Celebrate Spring is free for NNMCC members and children under 5, Family $5 or Single $2, cash at the door in addtion to the Tea Ceremony ticket price. Please pick up your advance tickets at the Nikkei Centre Information Desk on April 21st a minimum of 30 mintues prior to your seating time. What could be better than celebrating spring in a Kimono! Join the Kimono dressing session and enjoy the festival! There will be photo spots to take memorable pictures! Hair arrangement is also available upon request. Above price includes: dressing in Kimono, hair arrangement, tax, and participation for tea ceremony! To reserve a spot as a single or family unit, please contact at 604.777.7000 or info@nikkeiplace.org! We are happy to announce that we will be hosting the first drawing and calligraphy contests at the Celebrate Spring! This is a great opportunity to show your skills, to show your passion or just to see what you can do. Please join the drawing contest presented by Cheryl-sensei of Kokoro Art Studio, and the calligraphy contest presented by Fujiki-sensei of Isseikai. All ages are welcome! The prizes are generally donated by our craft and food vendors, on top of which there will be even more prizes! Please join us for a free film screening and learn about Japanese Canadian history in Manitoba. This film screening takes part in conjunction with the Beta Vulgaris: The Sugar Beet Projects exhibit. Through multiple interviews, archival video and images, director Aaron Floresco tells the story of Japanese Canadians in Manitoba coming to terms with a history many tried hard to forget. A story of overcoming indignity and redressing an injustice.